N2W is a voluntary programme set up to grow clubs and foster greater Pacific contribution to rugby leadership. It offers leadership development and mentoring for two specific groups (Pacific and Club Leadership) through workshops and ongoing assistance. These programmes are supported by a Pacific Advisory Group, and provide a one-to-one confidential, sustained mentoring relationship. The programme focuses on the current needs of the mentee and together the mentor and mentee design and maintain a professional support plan. Therefore, the issues discussed and tasks undertaken are unique and confidential to each mentor/mentee pair. N2W began in 2016 by gathering insights from Pacific people within the Auckland rugby community about their perspectives on Pacific contribution to non-playing rugby roles (see Ferkins, Dee, Naylor, & Bryham, 2017). This was because New Zealand Rugby had recognised a gap between the number of Pacific rugby players, and the number of Pacific people participating in non-playing rugby roles, particularly in Auckland. In 2017 the research team presented a series of workshops to the New Zealand rugby community, including the wider Auckland governance group meeting (mixture of NZR board and staff) in February 2017, Auckland Rugby Club chairman’s meeting in May 2017 and the provincial union CEOs and chairpersons’ forum in Wellington (July 2017). With strong support from these groups, the initiative has grown into an action research programme that seeks to create change by exploring how cultural understanding can be enhanced to develop leadership within the New Zealand Rugby system. N2W’s vision is to generate greater Pacific contribution to non-playing leadership within the New Zealand Rugby system, as well as develop greater cultural understanding and knowledge. If we can do this, we believe rugby leadership will greatly improve at all levels. 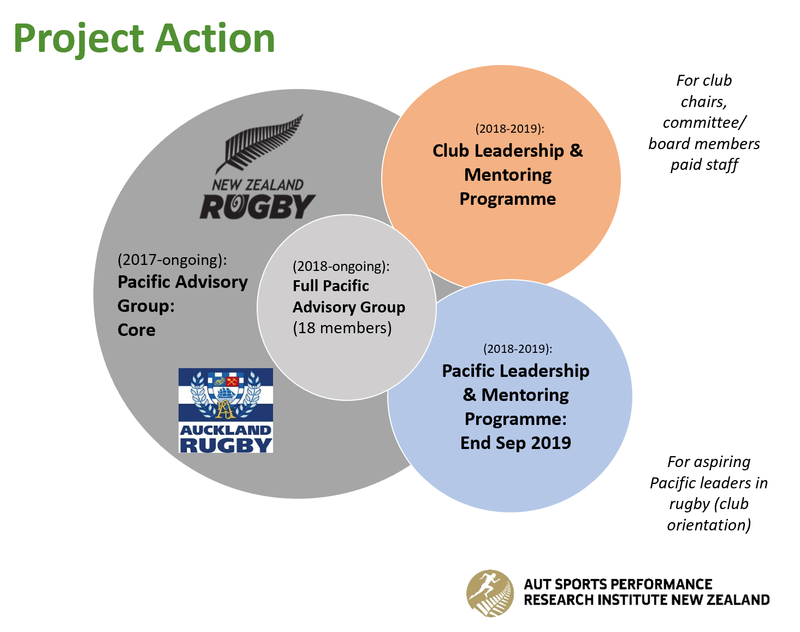 Two key programmes are now running in Auckland: a leadership programme for emerging Pacific leaders; and a cultural competence and leadership development programme for current rugby leaders primarily at club level. These programmes are overseen by a Pacific Advisory Group detailed below in Figure 1. Pacific Advisory Group (2017-2020): set up to oversee the project to completion. A Core Advisory Group (subgroup of the advisory group) provides ongoing advice and guidance to the project team. Club Leadership and Mentoring Programme (2018-2019): to develop understanding of Pacific culture within the New Zealand rugby community. This cultural competence and leadership development programme is for current rugby office holders/influencers. It began with a Club Leadership workshop followed by a mentoring follow-up programme. Pacific Leadership and Mentoring Programme (2018-2019): a leadership development and mentoring programme for Pacific people with aspirations to contribute to non-playing roles within the New Zealand Rugby system. It involves a Pacific Leadership workshop and then a mentoring follow-up programme. N2W is a unique project that focuses on a mutual exchange and development of capabilities of current office holders and emerging Pacific leaders in coaching, refereeing, management and governance roles within the New Zealand Rugby system. As a leadership and cultural development programme within a significant New Zealand sport, this project has the capacity to impact beyond rugby to generate know how, learning and experience for other sports seeking to embrace greater diversity in organisational leadership. Increased contribution of Pacific people in non-playing leadership roles in rugby. Enhanced cultural knowledge and understanding in current office holders within rugby. Greater understanding of Pacific culture within the New Zealand rugby community. Enhanced understanding of Pacific cultural obligations and how that affects involvement and engagement in non-playing leadership roles in sport. Expanded and strengthened leadership practice through encompassing Pacific and Western world-views. Generation of learning and know-how captured to share with other sport entities in relation to the development of cultural intelligence and leadership. Ferkins, L., Dee, K., Naylor, M. & Bryham, G. (2017). Navigating Two Worlds: Report for New Zealand Rugby on Pacific Island Involvement in Non-playing Rugby Activities. Auckland: New Zealand Rugby.